Devastated when my comic shop called to say number 10 was cancelled :(Really enjoyed the artwork and storyline. 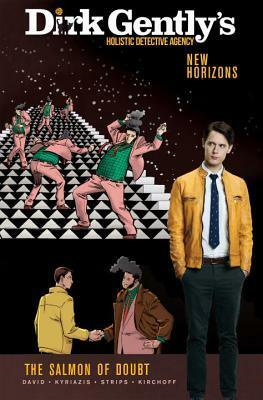 Another solid volume in the Dirk Gently graphic novel series with beautiful art and a story that ties in with the television show. Sadly, this is the last of the graphic novels (curse you IDW!!) and while The Salmon of Doubt issue #10 never saw the light of day, there is a script of sorts at the tail end of this collection in which Arvind Ethan David tells of Douglas Adams' impact on his life. This includes his initial exposure to Adams at the age of 11 and his journey onward including meeting Adams in person, working on a Dirk Gently play up to working on the Dirk Gently television show. The script details a bit of "interconnectedness of all things" which was fun to read. Apparently BBC America has cancelled the television series though there's an petition on a popular internet petition website to get a popular internet streaming service to continue producing the series. Fingers crossed that this is not the end of Dirk Gently. The second half of the story was just as weird as the first half. Still pretty good, but not great. Readable, but not as good as the Douglas Adams initial novel.If I hadn't read that, I might have given this book a fourth star, but it's still complex and weird, and doesn't really resolve any of the subplots, just postpones them a bit.Still, it's a fun story, and worth reading if you like the humor of Adams.